Turnstone in winter plumage, on the West Pier at St Ives, Cornwall; 21 Sept 2016. 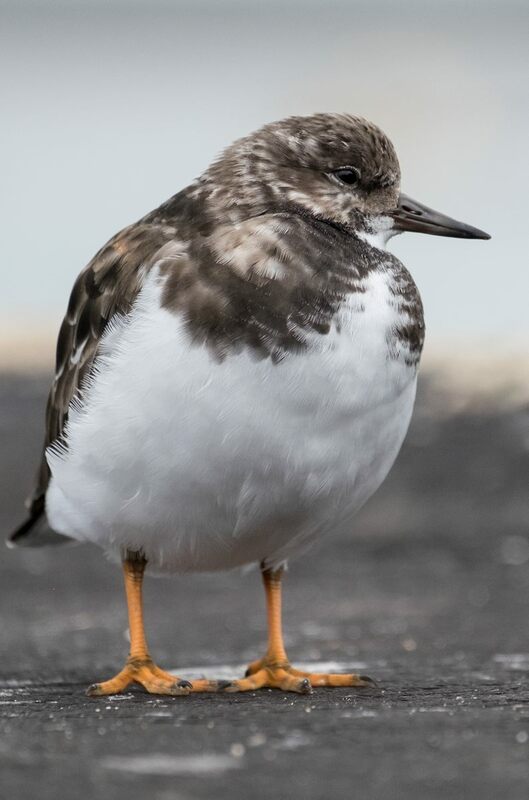 The Turnstone is a small wader (aka shorebird) that derives its name from its habit of turning over stones on beaches in the hope of finding things to eat underneath. Its usually a bird seen at a distance, small and brown on the foreshore. But at St Ives in Cornwall, especially when the tide is up, small groups dart about on this seaside resort’s promenade, often literally around the feet of holidaymakers. And so, being on holiday and carefree(! ), I bought a pasty as a second breakfast and sat on a seat munching the golden beast and staring out to sea, when several of these little birds swarmed around my feet. Well, I can take a hint, and as small pasty morsels were scattered around, these little creatures went into super-speed mode and downed the lot in an instant – for an ex-birder like me, almost a surreal moment! Technique: X-T1 with 55-200 Fujinon lens at 305mm (equiv); 800 ISO. 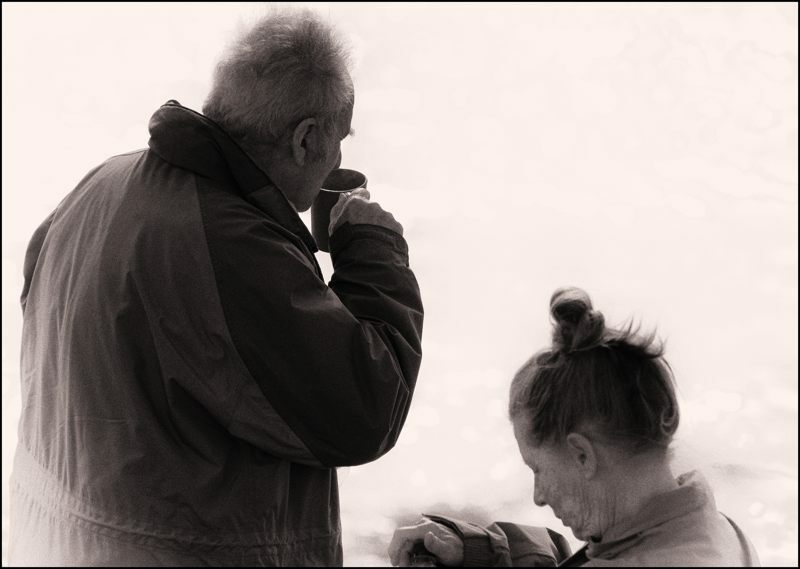 A couple having a hot drink beside the beach in the harbour at St Ives, Cornwall; 10 Oct 2013. The man is hunched over towards the right, sipping his cuppa, while the woman is inclined towards the left, intent on screwing shut her bottle of milk. Their two shapes tend to come together somewhat, in the shape of an arch or dome, an effect heightened by her inclined hair bun. I’ve tried to enhance this impression of togetherness by adding a slight, pale, circular vignette. Technique: D800 with 70-300 Nikkor lens at 300mm; 200 ISO; Silver Efex Pro 2’s Full Dynamic Smooth preset; mild copper toning. Juvenile Herring Gull in the harbour at St Ives, Cornwall; 27 Sept 2012. I have a liking for photos that appear more like the products of other media and here is something certainly heading that way – perhaps more like a pencil drawing? I’ve used a Soft Portrait preset, which includes pale vignetting, and the bird appears to be emerging from dense mist, with even its left wing nebulous and obscure. 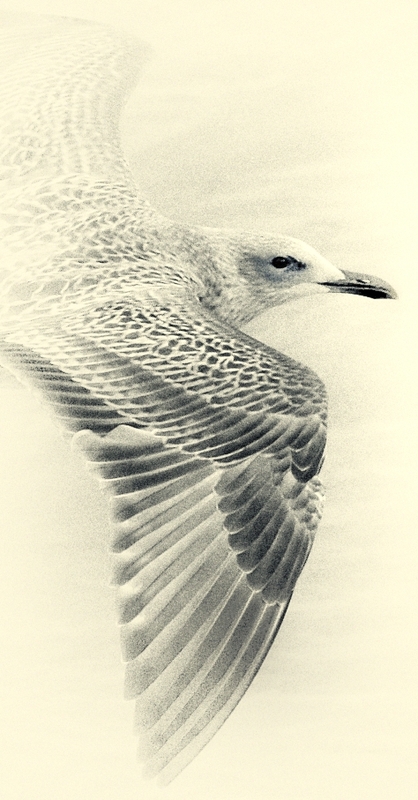 Using this preset has also almost completely obscured details of the sea below the bird – and this all makes for an artificially isolated vignette of the creature – a sketch in a notebook perhaps. Technique: D700 with 70-300 Nikkor lens at 300mm; 800 ISO; conversion to mono in Silver Efex Pro 2, starting at the Soft Classic Portrait preset, and giving the image the look of Ilford Delta 400 mono print film. The tide coming in, seen from the end of Western Pier at St Ives, Cornwall; 27 Sept 2012. This is a picture of the shallow wavelets of the incoming tide moving over the clean sand in St Ives Harbour – it was taken at the same time as another(!) The Tide Coming In. 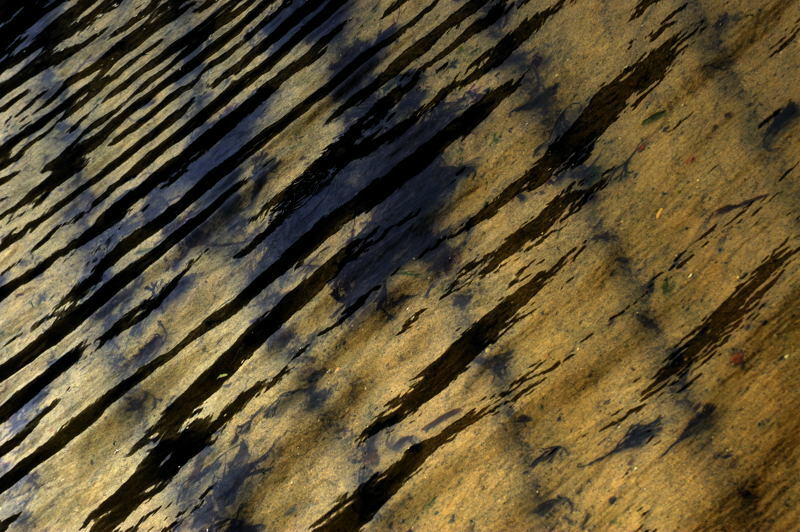 I like the dark purple-blues here, the black lines of the incoming wavelets, and golden brown of the submerged sand. The picture is starting to look more like a painting and, as always, I’m happy with that. Technique: D700 with 70-300 Nikkor lens at 300mm; 400 ISO; manipulated in Capture NX2. Adult Herring Gull, in winter plumage, beside the harbour in St Ives, Cornwall; 20 Oct 2016. A piercing stare – (s)he was sitting on top of a car parked on the harbourside, and I eased forwards, taking little steps, often pausing, and making a diagonal rather than head-on approach. The D800 was set for APS-C format, and so I had 450mm – 9x magnification – to play with. I made some very low clicking noises with my tongue, and (s)he looked at me. How I love gulls! They were all around during my childhood, they are all over Bristol now, and their wild calls are just that – a very welcome reminder of the wild across the city’s skyline. They fly in to the city very early each morning, while its still dark – because its ok to get lost when the day is just starting. But they leave before dusk, because getting lost at night is another matter entirely. Technique: D800 with 70-300 Nikkor lens, used in APS-C format to give 450mm; 400 ISO; Lightroom; Silver Efex Pro 2, starting at the Fine Art High Key preset. Young gull beside the harbour in St Ives, Cornwall; 20 Oct 2016. My guess is that this is a young Herring Gull, because the breast streaking is rather diffuse, but it could be a Lesser Black-backed Gull. Either way, it hatched from its egg in the summer, and is now well on the way towards its first taste of winter. It is standing by the harbour, it is “loafing” as birders say – it has eaten, it is not starving but, as is often the case with gulls, it is alert to all that is going on around it, and ever ready to dive opportunistically upon anything that presents itself – like your fish and chips! Click onto the image to open it in another winsow, and click onto that image to enlarge it. Technique: D800 with 70-300 Nikkor lens at 300mm; 400 ISO; Lightroom. Herring Gull and seaweed on the beach at St Ives, Cornwall; 24 Apr 2012. As with Moorings at St Ives, here, this was taken looking down onto the beach from West Pier. 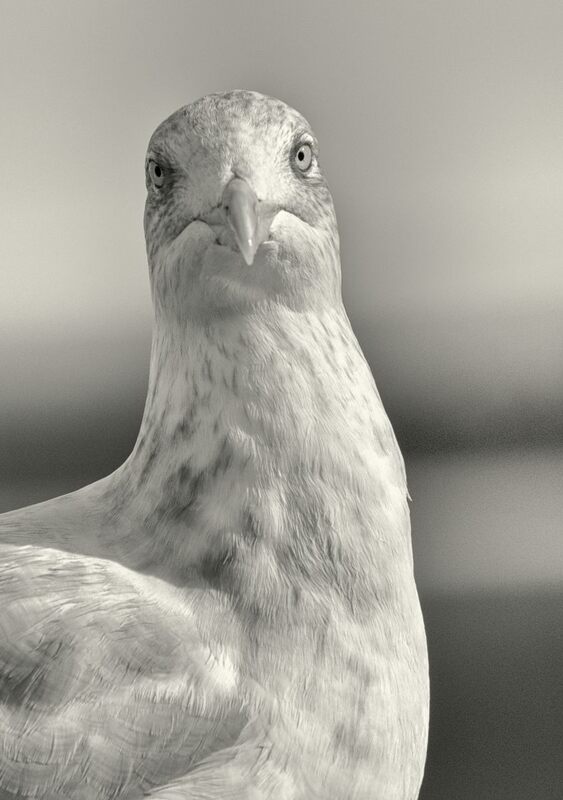 The gull was resting on the sands below the pier and, as I looked over, he tilted his head sideways, to look upwards and give me a long and very wary stare. Because his head is tilted onto its side, the beach and its seaweed appear to be on a vertical surface behind him. Technique: D700 with 70-300 Nikkor lens at 300mm; 400 ISO; converted to mono and further manipulated with Silver Efex Pro 2. 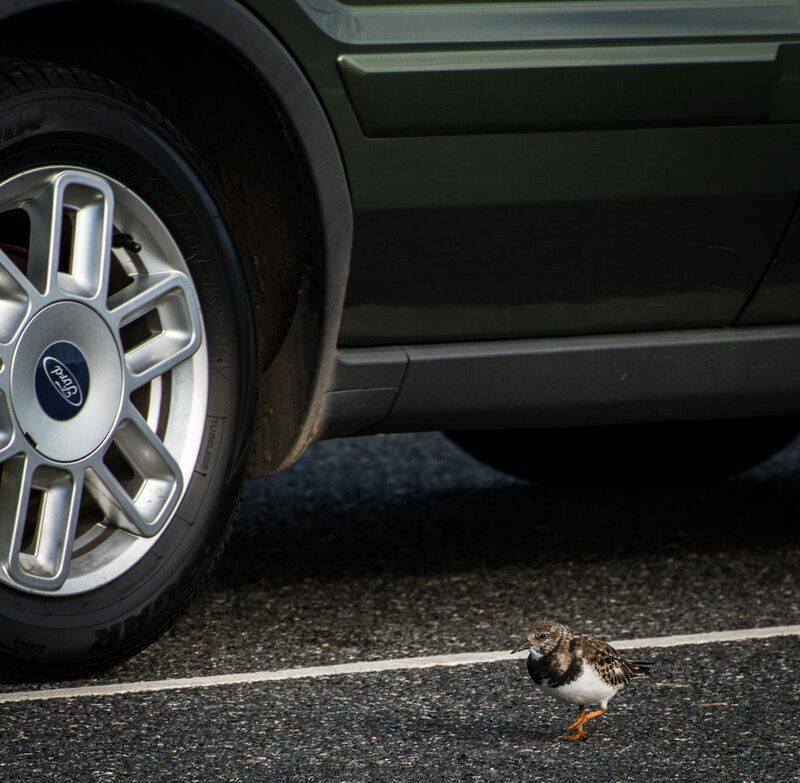 Turnstone in the main car park, Penzance, Cornwall. Turnstones are birds of rocky and often wild seashores, where they live up to their name by using their bills to turn over stones in search of food. 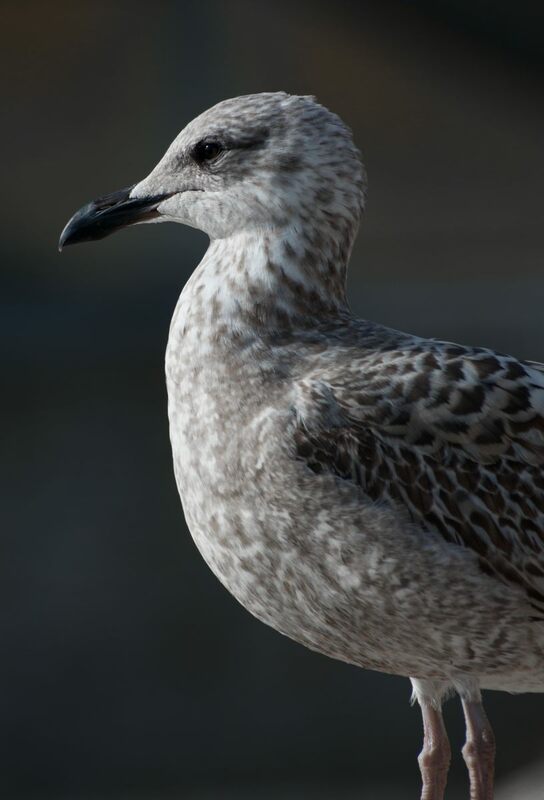 But here in Penzance, in the main car park beside the harbour – and along the promenade in nearby St Ives too – they regularly come up amongst us humans when the tide is in, searching for scraps. 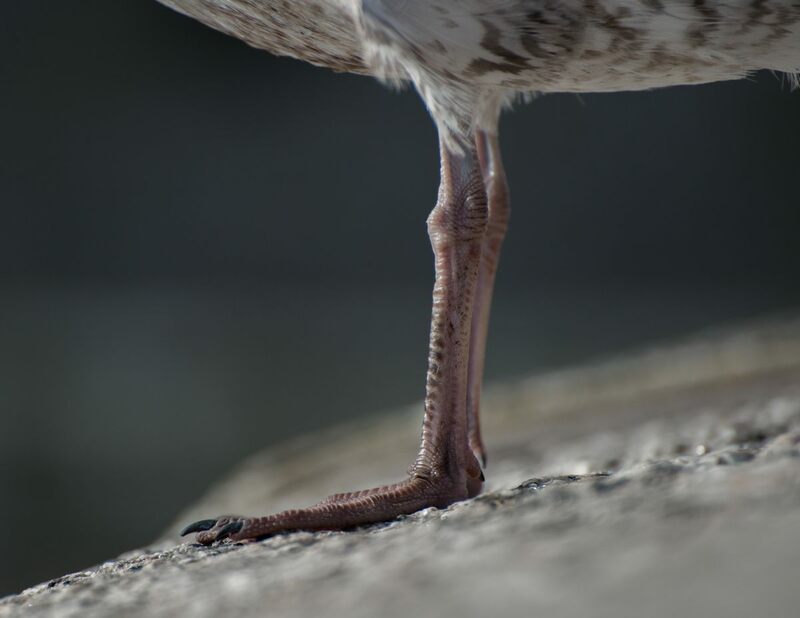 In St Ives especially, people are intrigued by these little birds scurrying around their feet, thinking them youngsters because they are so small. I bought a pasty on St Ives seafront, sat down to eat it, and had several around my feet within moments – it was delightful to have them so close, and they gobbled down every scrap of food dropped for them. Technique: as an ex-birder and someone who will always have an intense liking for birds (for me, their presence unquestionably boosts Quality Of Life), this shot is partly of ornithological interest – here is a little denizen of rocky and often wild coasts, usually observed only distantly, that has taken to foraging openly in a very busy, completely artificial, human environment. But to me also, in terms of composition, this image says something else too – here is the Natural World, very much overshadowed by, and under threat from, the requirements and encroachments of the Human World. There are other pictures of these Turnstones, all from St Ives, here, here and here. Turnstones are mostly brownish above in their winter plumage, but beautiful orange-brown tints appear on their backs in the summer – traces of which can be seen in a couple of these images. Click onto the image to open a larger version in a separate window. If your browser allows two stages of magnification: choose the larger. Technique: D800 with 70-300 Nikkor lens at 280mm; 800 ISO; 20 Oct 2016. Young Herring Gull on West Pier, St Ives, Cornwall; 20 Oct 2016. This the bird already pictured here. There are other recent gull shots here and here. D800 with 70-300 Nikkor lens at 300mm; 400 ISO. 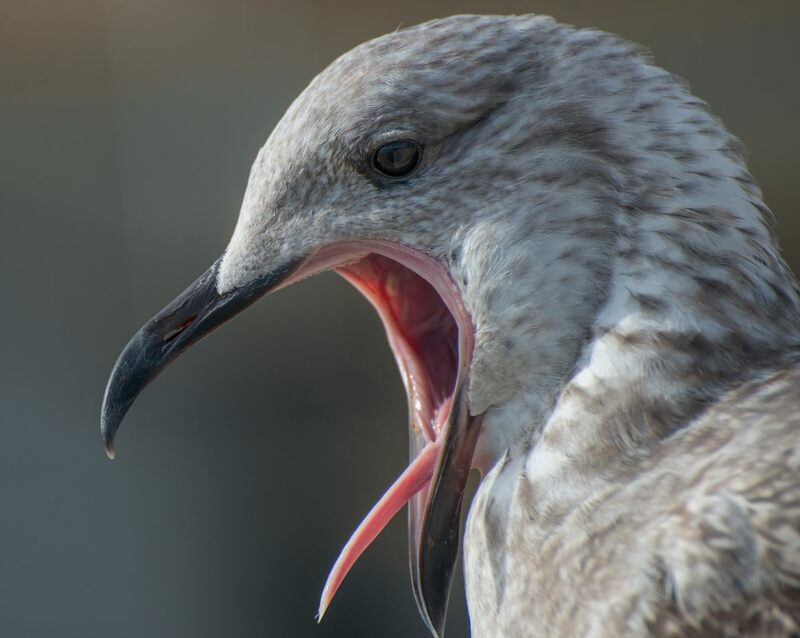 Gull yawning; St Ives, Cornwall; 20 Oct 2016. This is most probably a Herring Gull. The brown speckling on its plumage shows it to be a young bird, probably now just about to enter its first winter – it hatched from its egg this summer. It was perched on the wall of the West Pier at St Ives, “loafing” as birdwatchers say. Which means that it had had some food, that it wasn’t desperately hungry, so that it was just hanging around – while still no doubt keeping an eye out for any chance meal that might present itself. I leant against the wall and, very gradually, inched my way towards it, keeping silent, compact and low. It shuffled a little, it wasn’t quite sure about me (sensible bird! ), but then it relaxed, and I started gradually capturing images. I could have wished that the D800’s shutter was quieter but, on the plus side, its reliable autofocus did its usual excellent job, and I was able to concentrate on the images, rather than on whether they were sharp or not. There are earlier images from this recent gull series here and here.